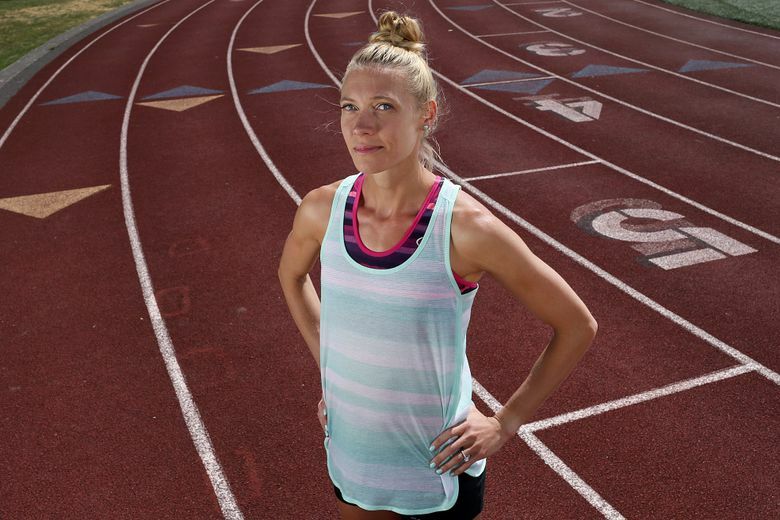 She qualified in the 1,500 meter race after earning a bronze medal in the event at the U.S. Olympic Track and Field Trials Sunday. It happened after the devastating 800 final on July 4 that saw Martinez and Alysia Montano trip over one another on the home stretch. 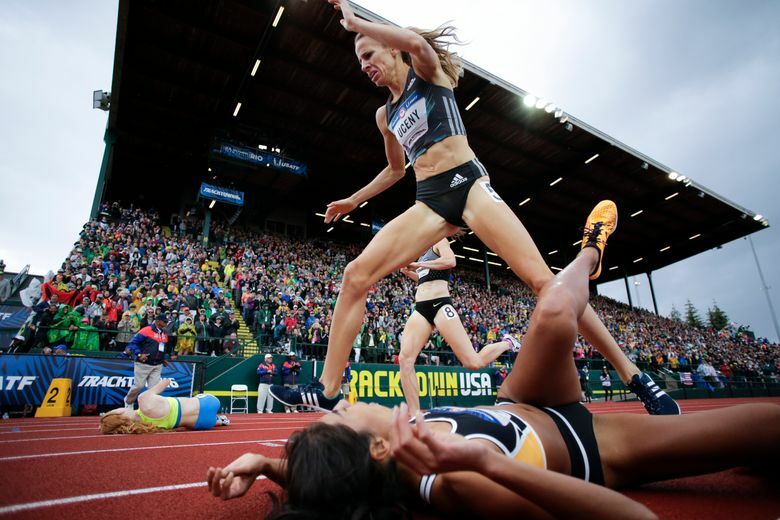 EUGENE, Ore. — Seconds after a breakneck sprint to the finish line in the women’s 1500 meter final at the U.S. Olympic Track and Field trials on Sunday afternoon, Brenda Martinez lay sprawled on her back on the red track, chest heaving, eyes closed, her face contorted into a grimace. At that moment, Martinez, 28, had absolutely no idea where she had placed in the race, her final shot at making the Olympic team. All she knew was that she’d given it everything she had, charging down the home stretch trying to catch the leaders, Jenny Simpson and Shannon Rowbury, as the crowd cheered her on. Her effort paid off as she earned the third spot on the Olympic team. 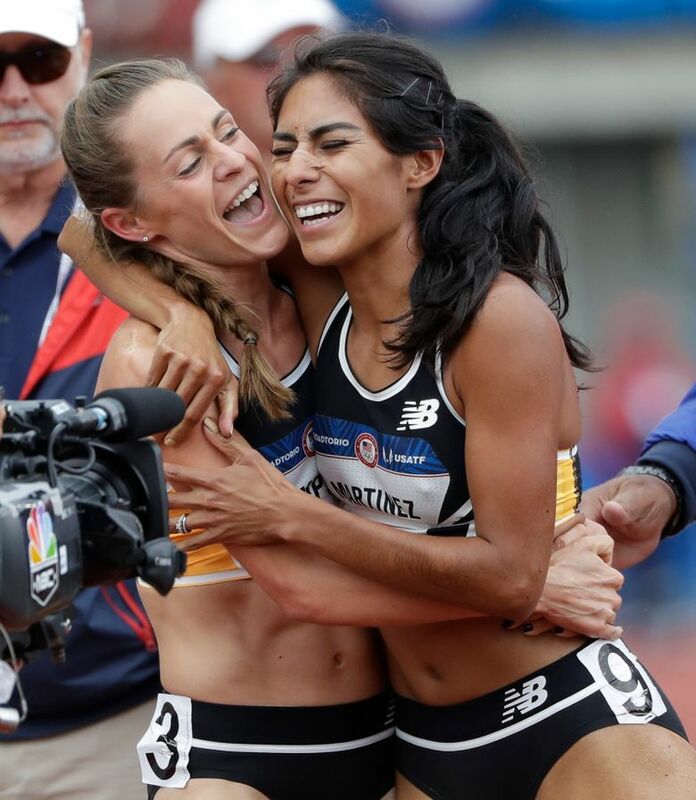 Martinez’s top-three finish was all the more gratifying because her moment of triumph came almost a week after the devastating 800 final July 4 that saw Martinez and Alysia Montano trip over one another on the home stretch. Martinez left the track in tears that night, but willed herself to rise above her disappointment and focus her efforts on the 1,500. With 150 meters left in the 1,500 finals on Sunday, Martinez kicked and sped toward the finish with every ounce of strength she possessed. She went from eighth to third as the finish line came into view. About five meters from the tape, Martinez glanced to her right, saw Amanda Eccleston barreling up to make a late challenge, then threw herself forward, literally falling into the finish line. Consciously or not, Eccleston picked almost that exact instant to do the same, and the race ended with both runners hurling their bodies forward, falling past the line and rolling to opposite ends of the track at Hayward Field. Two-time world championship medalist Simpson was announced as the winner with a 4 minute, 4.74 second finish and Rowbury (4:05.39) as the second-place finisher. Then, there was a long pause as the Hayward Field PA announcer waited for officials to determine who had placed third to clinch the final berth on the Olympic team. Caught in her own world of hurt and relief on the ground, Martinez didn’t realize she’d won the bronze medal until Simpson, her New Balance teammate, ran over and jumped on her. “I knew you could do it. I’m so proud of you,” Simpson exclaimed as she engulfed Martinez in a hug. Martinez’s time of 4:06.16 was a fraction of a second faster than Eccleston’s 4:06.19. “I did everything I could. I’ve never fallen like that at the end. My legs literally gave out at the line. You can’t ask yourself for anything more than that,” Eccleston said. Martinez, of course, was ecstatic. “You don’t give up on yourself, ever,” said Martinez, from Rancho Cucamonga, Calif. In Simpson, Rowbury and Martinez, the U.S. has a strong, experienced 1,500 trio. Each has won medals at world championships, and they hope to contend for medals in Rio. “The reason that Team USA does so well at the Olympics is that the selection process demands that we come and go through the fire,” said Simpson, who won gold in the 1,500 at the 2011 World Championships and silver in 2013. Martinez, especially, can relate to that. The 800 bronze medalist from the 2013 World Championships needed six races in 10 days and two dramatic finishes to earn a trip to her first Olympics. Ultimately, however, she believes everything she went through over the last week made her a stronger person and athlete. “I felt like (the 800 finals) happened for a reason,” Martinez said. “That’s the way I believe life works. You’re gonna get tested and if people can see what I went through, maybe they won’t doubt themselves the next time something happens to them.